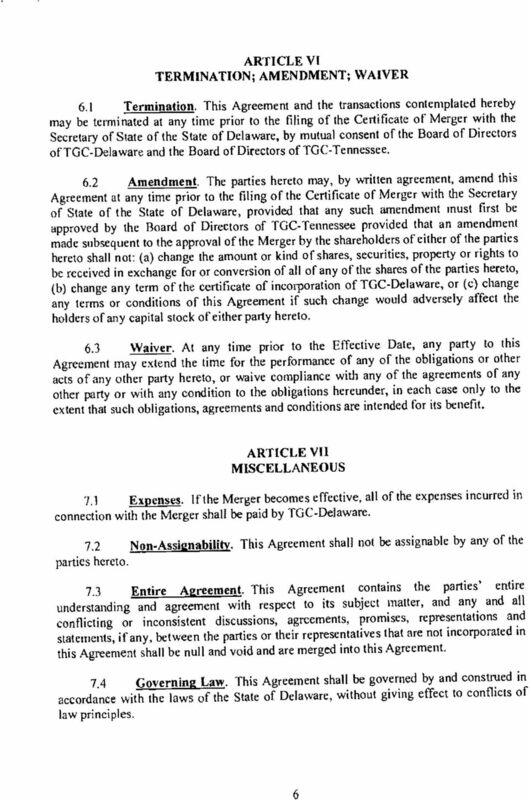 3 TUC-Delaware being the resulting or surviving corporation following the consummation of the Merger, has been presented to the Board of Directors and the terms and conditions of which have been discussed and considered by the Board of Directors; and WHEREAS, the Plan of Merger was presented to the Board of Directors, and upon review, the Board of Directors has determined that the merger as set forth in the Plan of Merger is in the best interests of the Company and its shareholders. NOW. THEREFORE, be it unanimously RESOLVED, that the Board of Directors has concluded. on the basis of several factors and after careful consideration of such information as the Board of Directors has deemed relevant that the Plan of Merger. 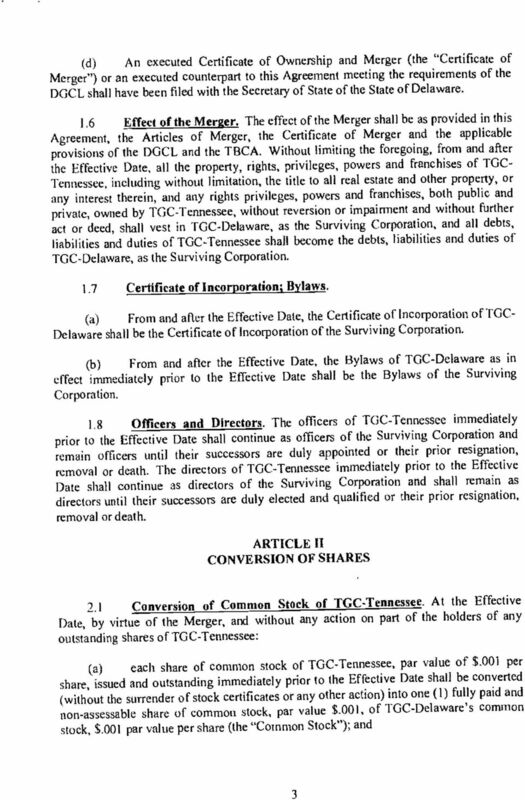 in the form presented and attached as Exhibit A to this consent should be, and hereby is, adopted, approved, confirmed and ratified: RESOLVED, that the Chief Executive Officer and any other appropriate officers of the Company are hereby authorized to make such changes, insertions therein and deletions therefrom that do not substantially change the terms thereof as the executin g officer, in the exercise of his best judgment and discretion and with the advice of counsel and other advisors, may approve; RESOLVED, that the Chief Executive Officer and any other appropriate officers of the Company are hereby authorized and directed to take and perform such steps and acts, and to execute such documents, as they. 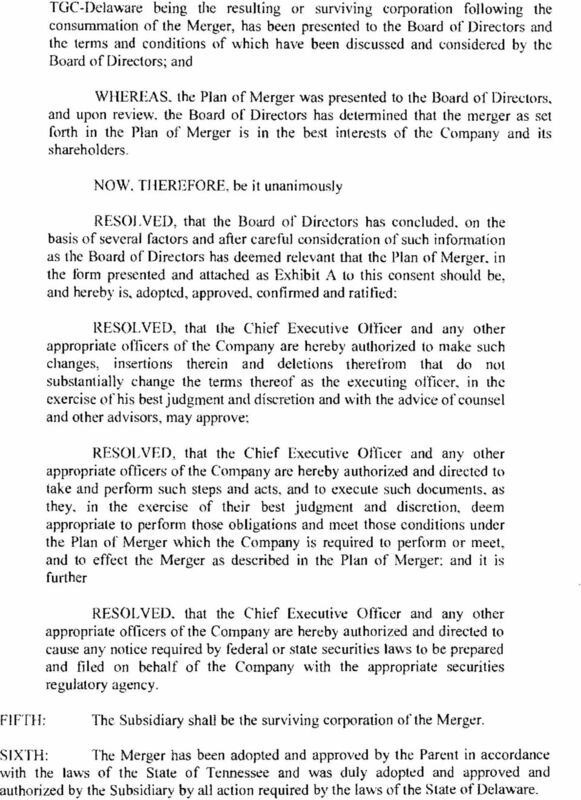 in the exercise of their best judgment and discretion, deem appropriate to perform those obligations and meet those conditions under the Plan of Merger which the Company is required to perform or meet, and to effect the Merger as described in the Plan of Merger: and it is further RESOLVED, that the Chief Executive Officer and any other appropriate officers of the Company are hereby authorized and directed to cause any notice required by federal or state securities laws to be prepared and filed on behalf of the Company with the appropriate securities regulatory agency. 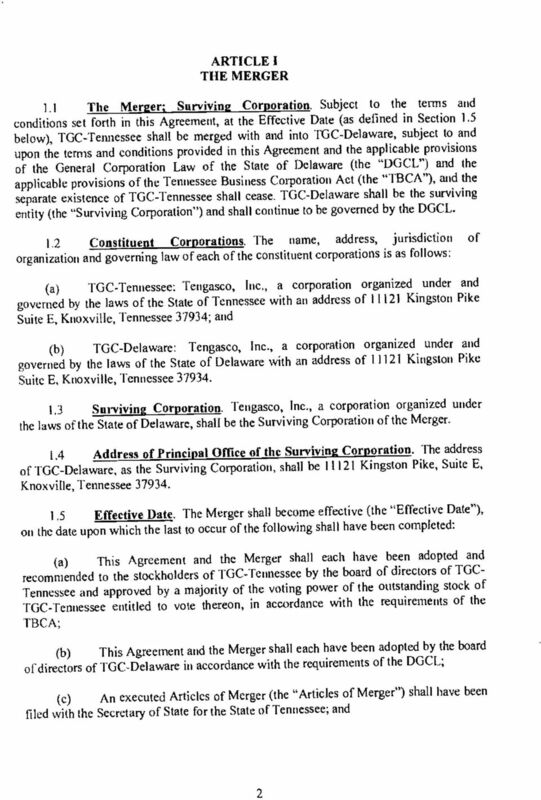 FIFTH: The Subsidiary shall be the surviving corporation of the Merger. 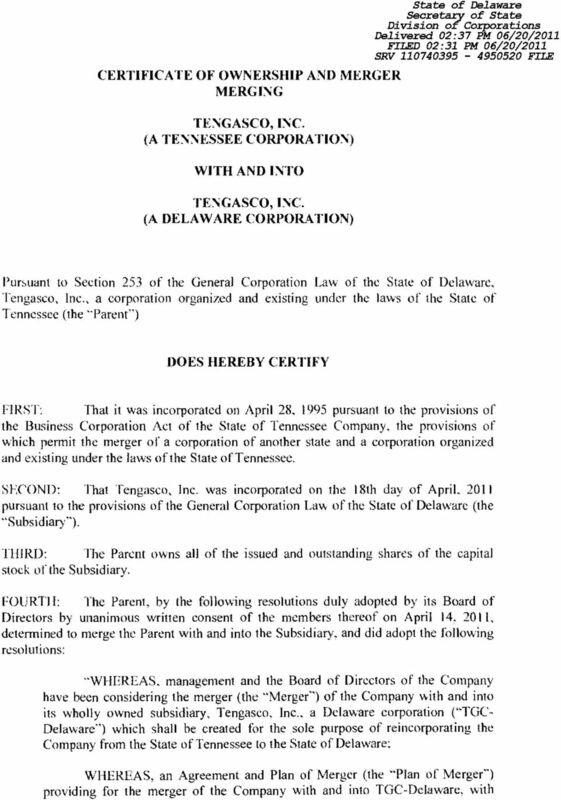 SIXTH: The Merger has been adopted and approved by the Parent in accordance with the laws of the State of Tennessee and was duly adopted and approved and authorized by the Subsidiary by all action required by the laws of the State of Delaware. 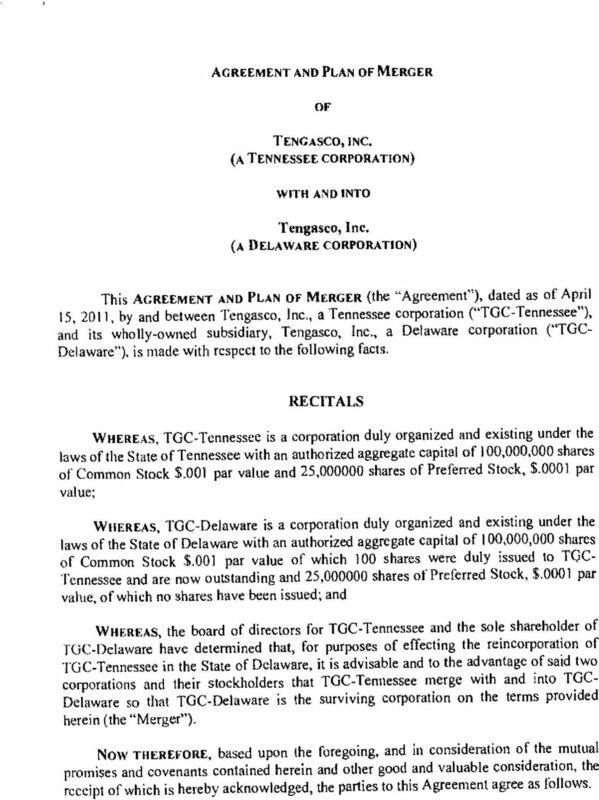 6 AGREEMENT AND PLAN OF MERGER OF TENGASCO, INC. (A TENNESSEE CORPORATION) WITH AND INTO Tengasco, Inc. (A DELAWARE CORPORATION) This AGREEMENT AND PLAN OF MERGER (the "Agreement"), dated as of April 15, 2011, by and between Tengasco. 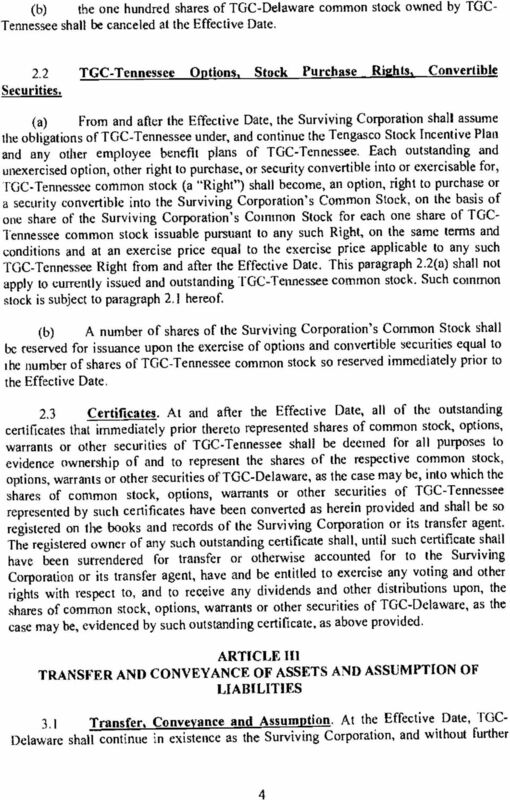 Inc., a Tennessee corporation ("TGC-Tennessee"), and its wholly-owned subsidiary, Tengasco, Inc., a Delaware corporation ("TGC- Delaware"), is made with respect to the following facts. 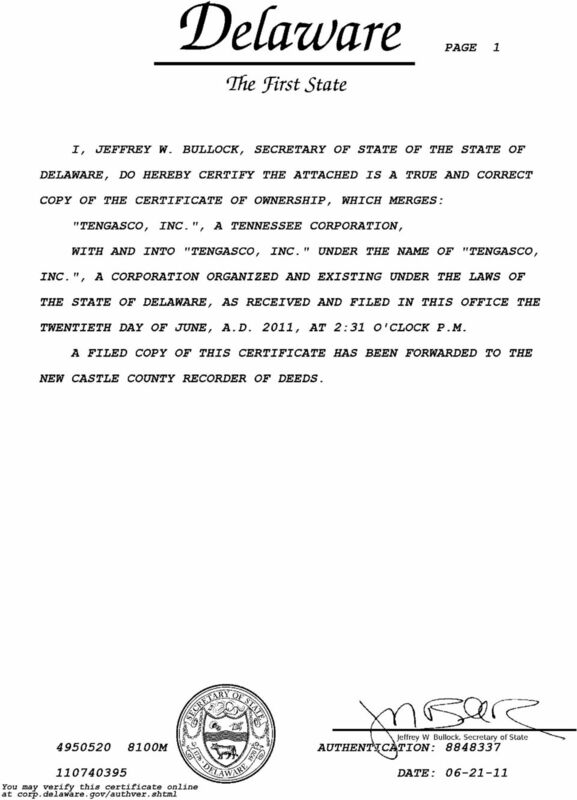 RECITALS WHEREAS, TOC-Tennessee is a corporation duly organized and existing under the laws of the State of Tennessee with an authorized aggregate capital of 100,000,000 shares of Common Stock $.001 par value and 25, shares of Preferred Stock, $.0001 par val ue; WHEREAS, TGC-Delaware is a corporation duly organized and existing under the laws of the State of Delaware with an authorized aggregate capital of 100,000,000 shares of Common Stock $.001 par value of which 100 shares were duly issued to TQC- Tennessee and are now outstanding and 25, shares of Preferred Stock, $.0001 par value, of which no shares have been issued; and WHEREAS, the board of directors for TOC-Tennessee and the sole shareholder of TGC-Delaware have determined that, for purposes of effecting the reincorporation of TGC-Tennessee in the State of Delaware, it is advisable and to the advantage of said two corporations and their stockholders that TGC-Tennessee merge with and into TOC- Delaware so that TGC-Delaware is the surviving corporation on the terms provided herein (the "Merge?). NOW T EREFORE, based upon the foregoing, and in consideration of the mutual promises and covenants contained herein and other good and valuable consideration, the receipt of which is hereby acknowledged, the parties to this Agreement agree as follows. NOTICE OF MERGER of FSM DELAWARE, INC. with SAKER HOLDINGS CORP. To the Former Holders of Record of Common Stock of FSM-Delaware, Inc.